First-person vision (FPV) goggles. The phrase may garner blank stares from many people who are not yet familiar with the technology. Even those who are familiar with it may have limited knowledge. Aren’t they those gadgets that can be used with a cell phone? Or, aren’t they what kids use when playing video games? Well, yes, they are most commonly known as toys or tech accessories for computer-generated virtual reality and video games. However, they have the potential to be much more than a toy when paired with a drone to help supplement bridge inspections. Connected directly to a drone’s video feed, FPV goggles give bridge inspectors a first-person visual that is equivalent to being about 3 feet (0.9 meters) away from the components they are inspecting. This is accomplished by positioning the drone 6 feet (1.8 meters) from the component and utilizing the two times digital zoom. The visual image is so clear and immersive it gives the inspector a relative image size equivalent to an 18-foot (5.5-meter), 1080 pixels high-definition television screen. 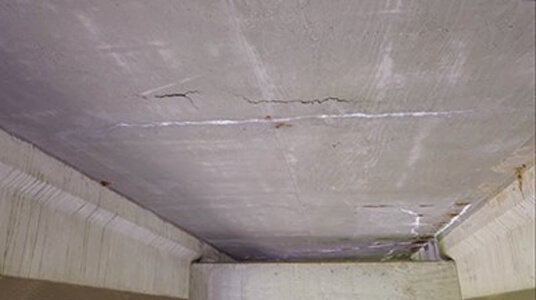 The technology has potential to enable inspectors to visually examine bridge components easily and with enough precision to see even hairline cracks in the field. It offers these benefits without requiring standard inspection techniques, such as using ladders, climbing equipment, or bridge inspection vehicles (snoopers), which can be costly and potentially hazardous. View this video footage of drone operations under a bridge deck with the corresponding view from the drone camera. This technique of using a drone with FPV goggles for bridge inspections is the result of a number of factors that have changed or developed recently. Notably, these include the release of the Federal Aviation Administration (FAA) Part 107 rule regarding civil operation of small unmanned aircraft systems (UAS), FHWA’s support of using of drones as tools for supplementing visual bridge inspections, and recommendations issued by the Minnesota Department of Transportation (MnDOT) based on its Unmanned Aerial Vehicle Bridge Inspection Demonstration Project. FHWA’s technology transfer (T2) program and recent approval of the FHWA Minnesota Division’s T2 funding for UAS bridge inspections continue the momentum. For more information, visit FAA’s website. FHWA encourages the advancement of new technologies by state and local public agencies (LPAs) in their design, construction, inspection, and maintenance to support an efficient and effective transportation system. As drones have emerged as leading technology in the area of industrial construction, FHWA’s Office of Bridges and Structures has allowed the use of drones to supplement bridge inspection procedures and to potentially improve routine bridge inspection processes and documentation. For more information, see “Ready for Takeoff” in the Winter 2018 issue of Public Roads. The FPV goggles, costing approximately $450 at the time of publication, are wirelessly linked to the drone’s camera, and receive high-definition video feed at 1080 pixels and 30 frames per second. The video feed presents on two separate displays with a resolution of 1920 by 1080 pixels and is transmitted at a speed with a latency of 110 milliseconds. 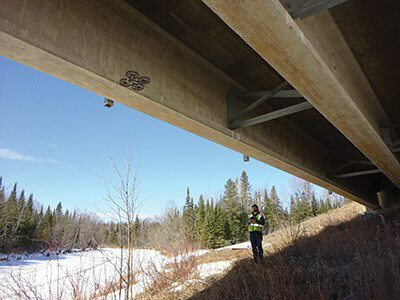 When a bridge inspector uses the connected drone and goggles, the visual impression is described by the manufacturer as being equivalent to an 18-foot (5.5-meter) high-definition, large screen television at a distance of about 9 feet (3 meters). The goggles may be combined with a digital zoom of up to two times, enabling the image equivalent of standing as close as 3 feet (0.9 meters) from the objects being inspected. Beyond the high-definition and immersive images, the goggles have the capability to give the inspector control over the movement of the camera. The goggles can operate the pitch and yaw of the drone camera: pitch up and down of 90 degrees below horizontal to 30 degrees above horizontal and yaw left and right of 30 degrees. With this seamless operation of the drone’s camera, inspectors can very easily look at the item of interest. The drone and FPV goggles are interactive. The goggles can be set to control the camera gimbal, which facilitates the goggle movement to change the camera angle. The camera gimbal is the device that enables the camera to rotate freely in any direction or suspends it so that it will remain level when its support is tipped. The inspector can easily adjust the camera view by simply turning his or her head. For example, when an inspector looks to the left, the drone’s camera rotates with this movement. Then, as the inspector looks to the right, the camera gimbal follows. The drone is stationary, but the view changes via the goggles’ gimbal control and the head movement of the inspector. You can view a video demonstration at https://youtu.be/Ahf9akBEtxw. After demonstrating that FPV goggles, when paired with a drone, can be useful for bridge inspectors to supplement bridge inspections, the Minnesota Division started a presentation and outreach program. The program began with some regional meetings with county engineers and bridge inspection staff. In 2017, division staff gave the presentation and demonstration during 10 meetings, reaching about a third of the 87 counties in Minnesota. This led to an invitation to present the topic at the Minnesota County Engineers Association winter conference in January 2018, where the presentation was given to more than 150 professionals, representing all of the counties in the State. As a result of these outreach efforts, four counties will be incorporating drones with FPV goggles as part of their 2018 routine bridge inspections. The FPV goggles that many people see as merely toys can be easily connected to a consumer drone to create a great tool for bridge inspectors. The availability, cost effectiveness (approximately $2,800 or less), and high-definition video output of the drone, combined with the seamless connection of the video feed to the high-definition displays of the goggles, result in a system that can easily be added to the toolbox of any bridge inspector.